I may be a bit biased but doesn't she look beautiful! 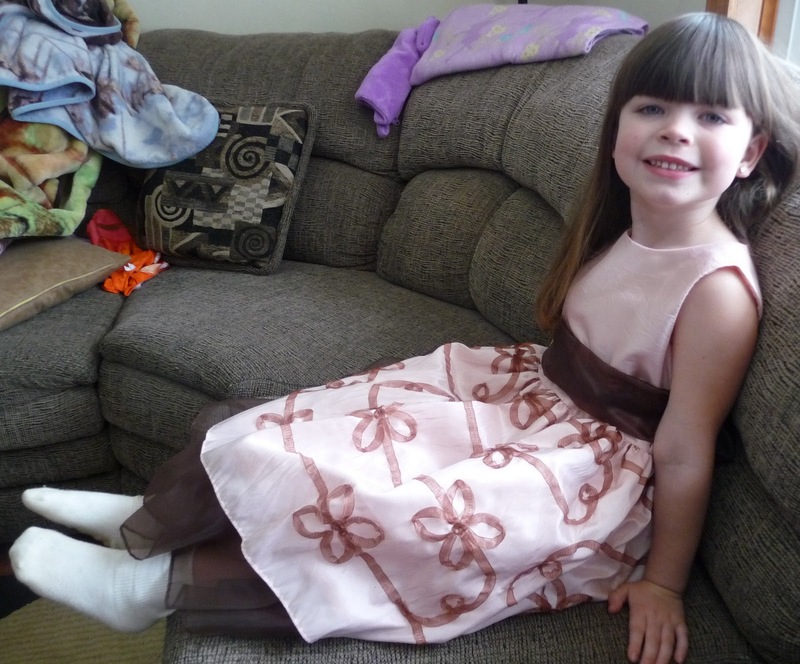 We received the Pink Flower Girl Dress which features a Solid Bodice with Ribboned Taffeta Skirt for our review. As you can see it is lovely! I was so impressed with the quality of the dress as well as the way it fit. Yes it is a little long on her now, but I did that on purpose so we would get plenty of wear out of it. My daughter is almost 5 and the dress is a size 6, so that should give you a good gauge of their sizing. The dress arrived on a hanger with a plastic bag cover which was very impressive. It's a little hard to tell by the photo itself, but the dress is actually a very beautiful light pink with the brown accents and bow. She's already made plans to wear it to church on Easter, and I think that is a perfect fit. Really just because it's called a flower girl dress doesn't mean that is what it has to be worn for. I can't wait to pair this up with a cute brown sweater and dress shoes. Buy it: Pink Princess carries a wide variety of Flower Girl Dresses, First Communion Dresses, Christening Gowns, Flower Girl Accessories, Kids Costumes, Pettiskirts & Tutus, Boys Formal, and Holiday Dresses. Win it: One lucky reader will win a Pink Princess $15 gift certificate. This giveaway will end Feb 25th at 10 PM EST. The winner will have 48 hours to respond to my email. If no response, a new winner will be chosen. Open to residents of the US. Mandatory Entry: (Mandatory entry must be completed first or bonus entries don't count.) Please use form for ALL entries, except daily tweets. *What would you use the certificate towards if you win? • Tweet this giveaway (may be done once per day - please leave a comment with your tweet status) "RT #win a Pink Princess $15 GC HERE: http://bit.ly/az5Dls (Ends 2-25) #Giveaways"
Disclosure: Thanks to PR Firm/sponsor I was provided with this product for the purpose of my personal review. This blog post is not a paid post and the honest opinions stated are my own.